When I saw the theme for Little Thumbs Up is Noodles, I just couldn’t resist not making a dish for this event! I love making pastas because they are such a one-plate comfort – I can have both carbohydrates and proteins in just one serving! While looking at my pasta recipes that I’ve blogged before, I realised many of my pasta recipes are very similar. They are mainly aglio olio and stock-cream-combination based. I still am not a very huge fan of creamy pastas as they are too heavy for me. And today I’m adding another one to the list! 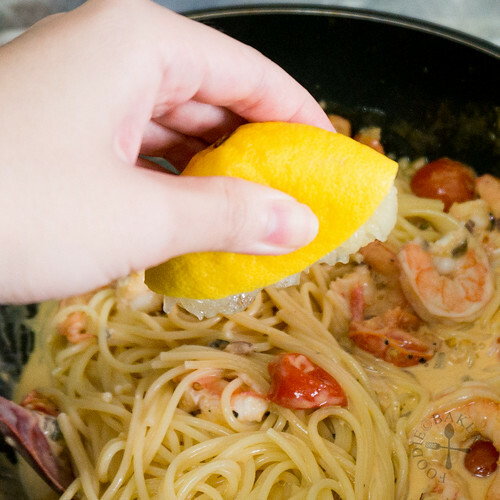 I like lemon pastas because when lemon juice is combined with plenty of freshly grated parmesan and olive oil, they make a very light, tangy and refreshing sauce that coats the pasta lightly and keeps me coming for more. However, when I tried making for X, he found the taste really weird, so I haven’t been making them for a really long time. So this time, I decided to add lemon juice into a stock-cream-combination pasta, so that the lemon taste is not as strong, hoping X will be more receptive about it. 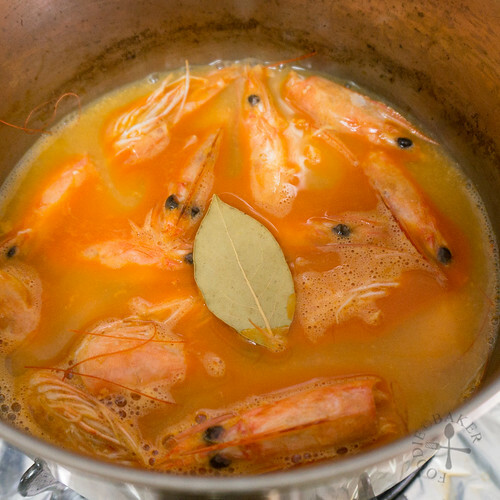 I’ve decided on using prawns for this recipe because firstly, seafood and lemon definitely go well with each other and secondly, I wanted to use the prawn carcasses to make the stock base. This is an additional step, but trust me, it’s really quick and easy to prepare and the results are definitely worth it! 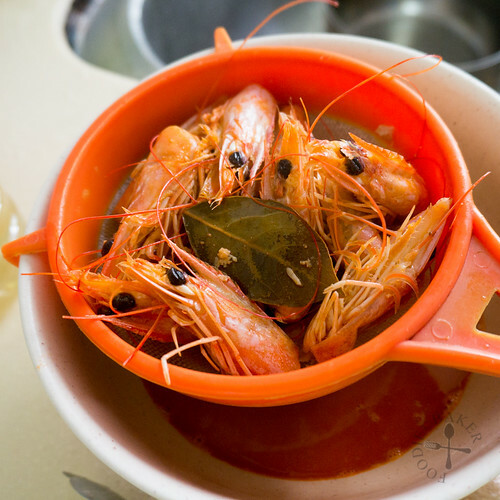 Prawn carcasses contained so much flavour and it makes your stock naturally sweet and tasty with an umami flavour without the need of adding other ingredients. Of course you will need other vegtables if you are making a huge pot of stock for soups, but if you are just making a little for pastas or stir-frys, do give this a try! But of course you can always use a stock cube / chicken stock if you don’t feel like making the stock or are using ready peeled prawns. 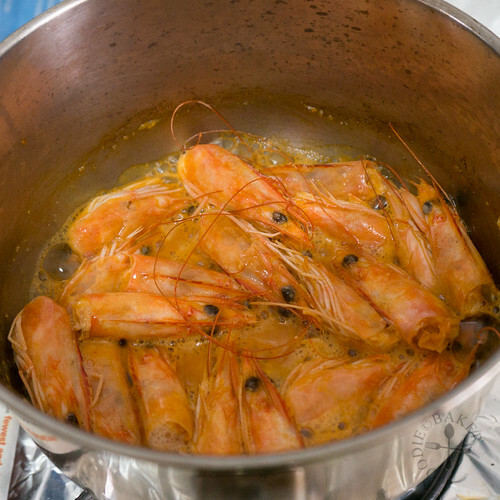 The prawn stock is then combined with sautéed onion, garlic and chili flakes and further reduced in the saucepan, before cream and lemon as added to thicken the sauce to a consistency to coat the pasta. I would have used linguine to mop up the sauce but I only have spaghetti at that moment so that’s what I used. The lemon will taste really strong when you first add them but will become more mild as you cook the sauce longer, so I suggest serving lemon wedge at the side for those who want an extra zing! Let’s see how it’s made! 1) First, let's make the prawn stock. Sauté the prawn heads in a little oil. 2) Until all the prawn heads have turned pink. 3) Add in water. 4) And a bay leaf. Other herbs can be used too! 5) Boil and reduce by half then strain, discarding the bay leaf and the prawn heads. 6) Devein your prawns and rub-in some salt. Set aside for 10 minutes, then rinse and pat dry. This helps to keep the prawns firm. 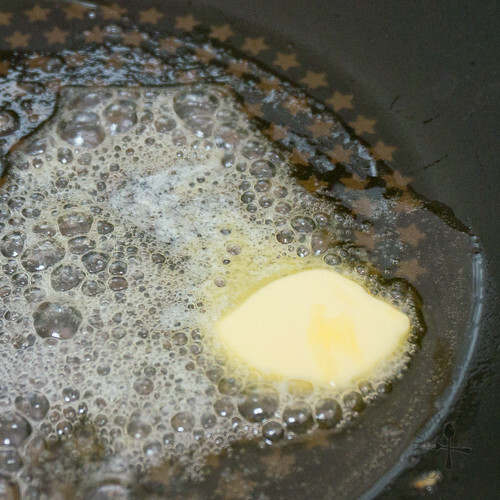 7) Heat oil and butter together. 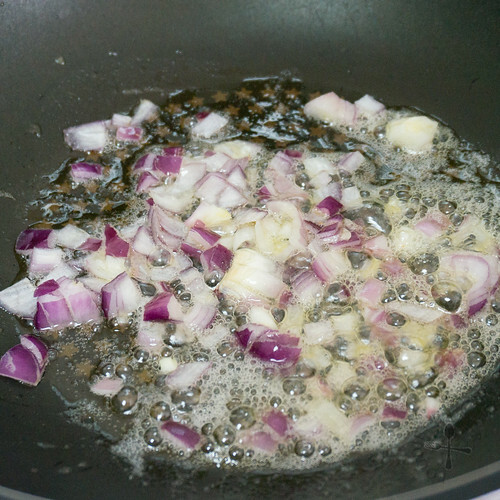 8) After butter has melted, add in chopped onion and sauté until translucent. 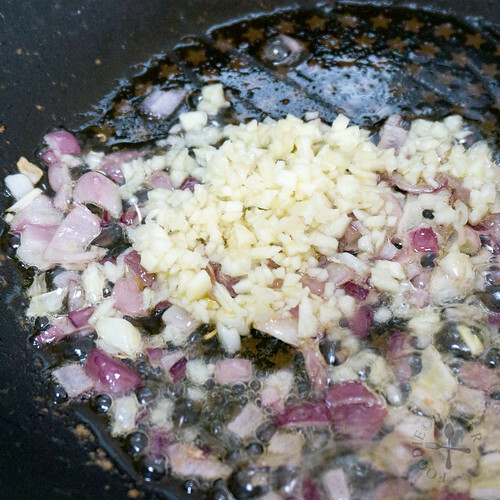 9) Add in minced garlic. 10) Followed by chili and sauté until fragrant. 11) Add in your prawns and cook until they have turned pink. Remove the prawns and set aside. 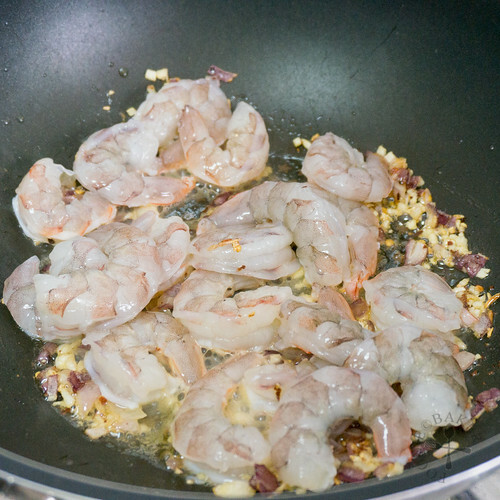 12) Add in the prawn stock from earlier to deglaze the pan. 13) Bring to boil and simmer until reduced by 1/2. 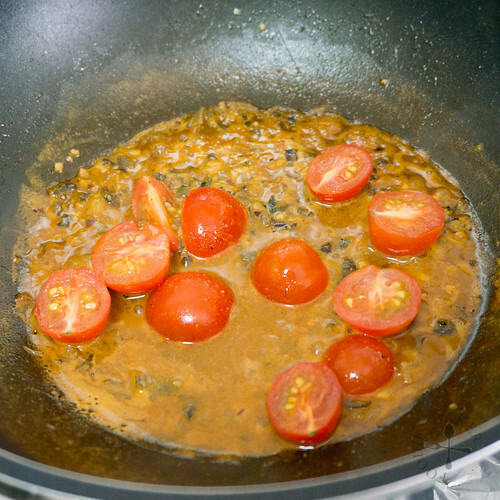 14) Add in some cherry tomatoes - purely optional! 15) Follwed by cream. 16) Simmer again until reduced by 1/3 then add in the prawns. 17) Add in the al dente pasta. 18) Squeeze in some lemon juice for the tangy kick! Toss until pasta is heated through and sauce has thickened. Season with salt and freshly ground black pepper and it's done! 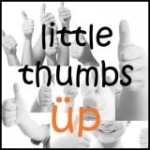 I’m going to submit this to Little Thumbs Up organised by Doreen from my little favourite DIY and Zoe from Bake for Happy Kids. 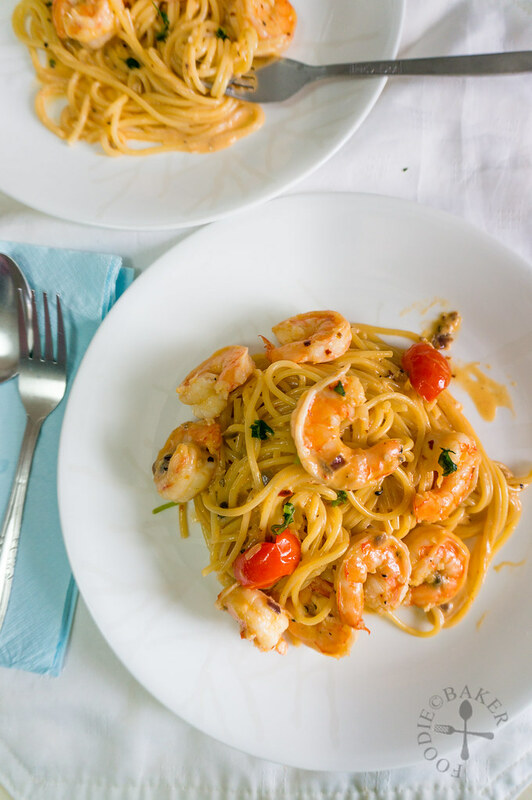 This month’s theme is Pasta / Noodles – hosted by Anne from My Bare Cupboard. The recipes are all linked at this post! Bring a large pot of salted water to boil (1 litre to 1 tablespoon salt). Cook the pasta until al dente. Drain and rinse well under cold water. Drain and set aside. Rinse and peel the prawns, reserving the heads and discarding the shells. 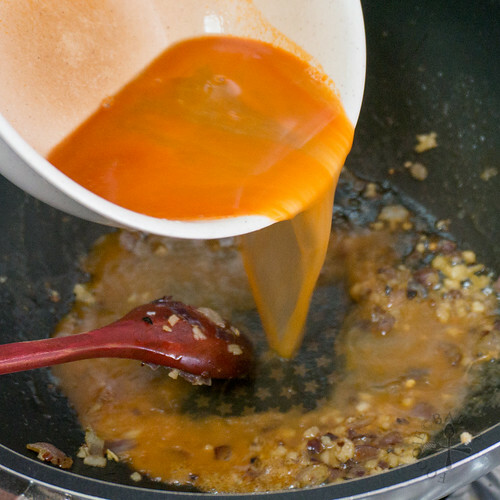 In a small pot, heat 1 tablespoon oil over medium heat. Add in the prawn heads and shells and sauté until the heads and shells turn orange. Add in the cup of water and bay leaf and bring to a boil. 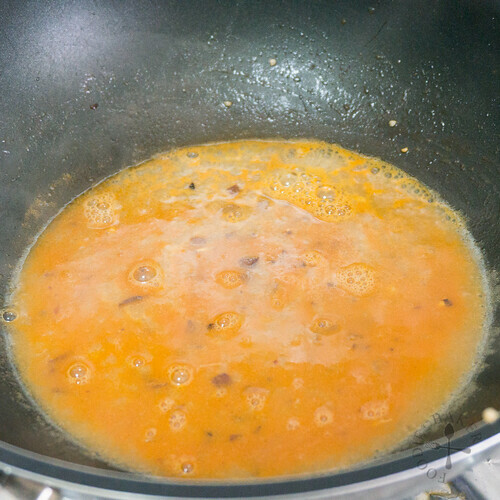 Simmer until the stock has been reduced by half. Drain, discarding the prawn shells, prawn heads and bay leaf, and set the stock aside. Devein the peeled prawns, drain well and season with salt. 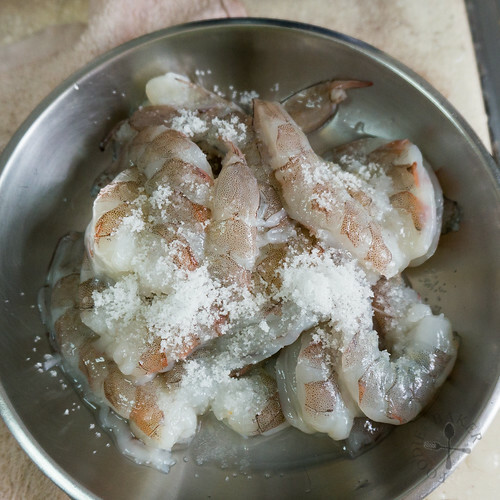 Rub the salt gently into the prawns and set aside for 10 minutes. 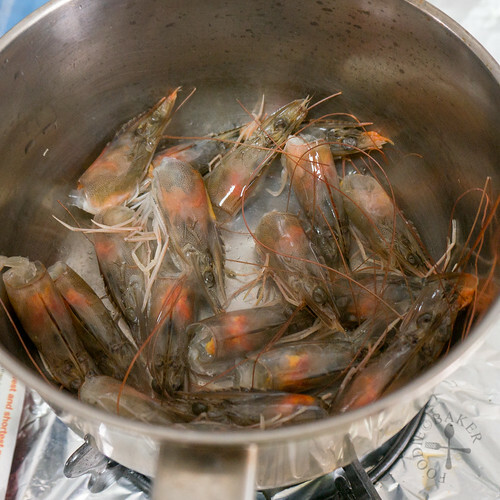 Rinse and pat-dry the prawns with paper towels. Set aside. 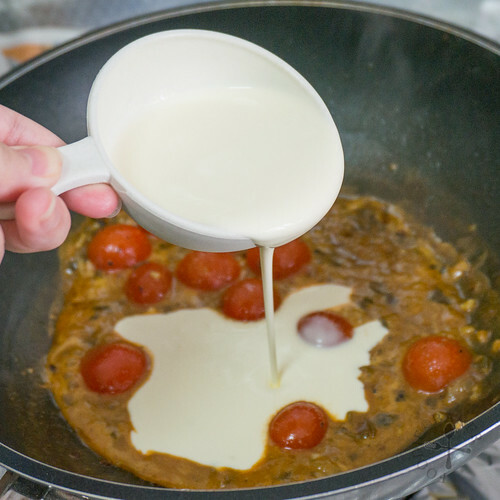 In a large saucepan (enough to hold the pasta), heat the remaining tablespoon of oil and the tablespoon of butter over medium heat until the butter is no longer foaming. 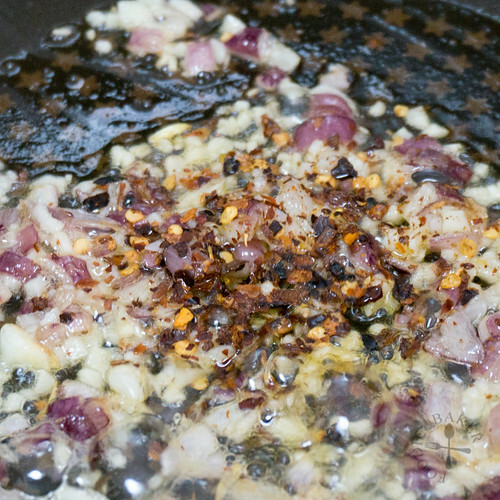 Add in the chopped onion and sauté for 3 minutes, add in the garlic and chili flakes and sauté for another 2 minutes until fragrant. Add in the peeled prawns and sauté until the prawns are fully cooked. Remove the prawns and set aside. Add in the prawn stock and cherry tomatoes. Bring to a boil and deglaze the pan. Simmer until the stock has been reduced by half. 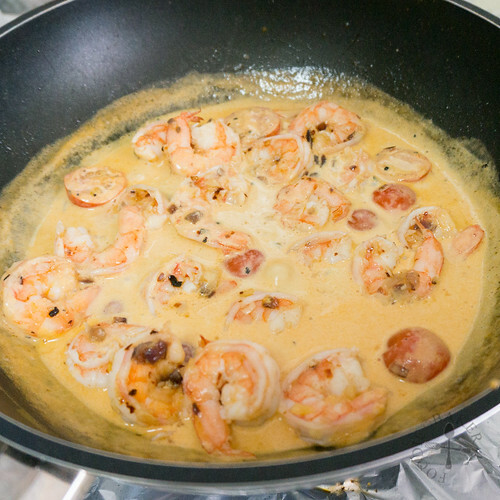 Add in the cream and simmer until the sauce has been reduced by ⅓. Stir in prawns, pasta and lemon juice. Season with salt and freshly ground black pepper. Heat gently until the pasta is heated through, plate and serve with lemon wedges on the side. 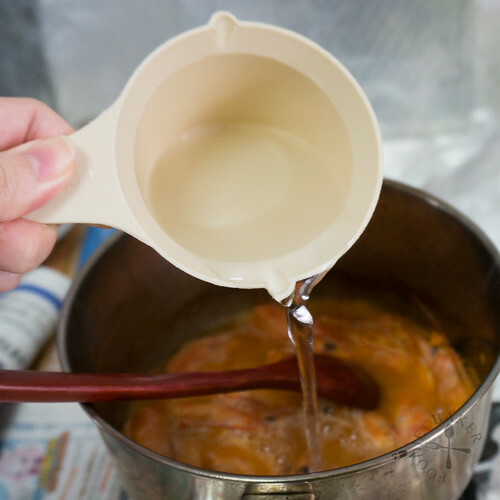 - If you are using peeled prawns, use ½ cup of stock (chicken, vegetable etc) in place of the prawn stock. The recipe sounds awesome I am going to try this out soon. Just how long do u simmer the prawn stock for? 15-20 mins? Cos I don’t want to reduce it that much. I know mosy shrimp stocks u simmer 45 mins but its with other ingedients & more shrimp shells and heads. Hi Lilian, yes the prawn stock is simmered about 15 to 20 minutes. If you find that there’s not enough sauce for the pasta, you can add a bit more water/cream. Thanks i was kinda scared not enough prawn stock so i was gonna save some extra pasta water or cream. Gonna try out this recipe i’ll let u know how it goes! 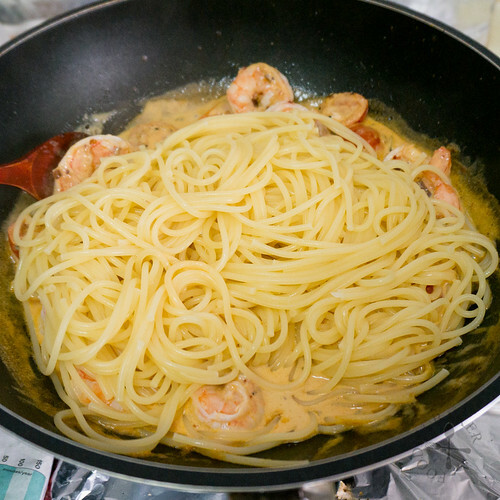 I have tried many shrimp pastas recipe before (shrimp scampi, shrimp carbonara, shrimp marina etc) but I do like a cream sauce (not too heavy sonetimes I use half and half) but adding Prawn Stock is ingenius step to improve the taste! Hi Laura, I’m so happy you love this! I’ve not made this for a long time, I think it’s time to make them again 🙂 Have a great week ahead! Delicious. I’ve never done that thing with making stock from the prawn heads before but u r right, it makes a massive difference to depth of flavour. Thanks for the wonderful dinner we’ve just had! Hi Hasline, I’ve got pre-cooked prawns in my freezer but i would really like to make this recipe. My local asian-indonesian shop sells prawn stock in jars. How many ml of prawnstock would i need for this recipe? Ok thank you very much! I’ll try this recipe tomorrow! BTW. I’m so sorry i made a typo when typing your name in the previous comment. Hi Henk you are welcome! And no worries about the typo 🙂 Hope you will like this recipe as much as I do! 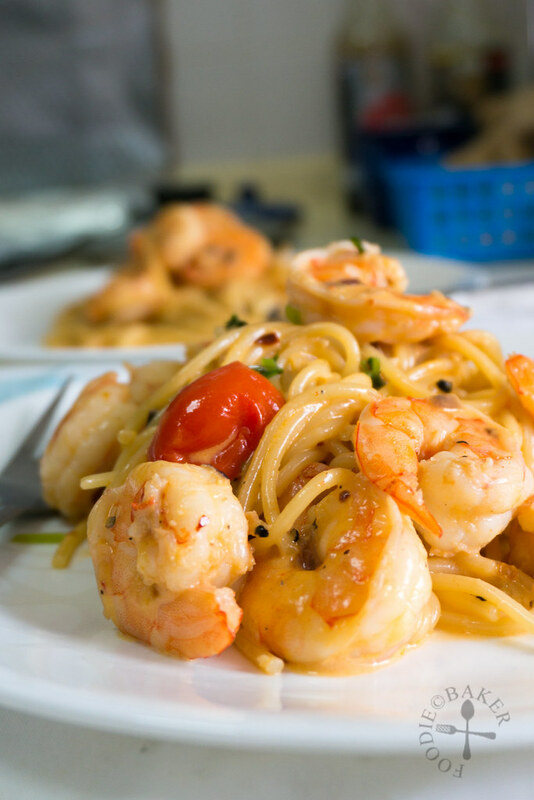 You are “killing” me with all these beautiful pictures of your creamy prawn pasta!!! 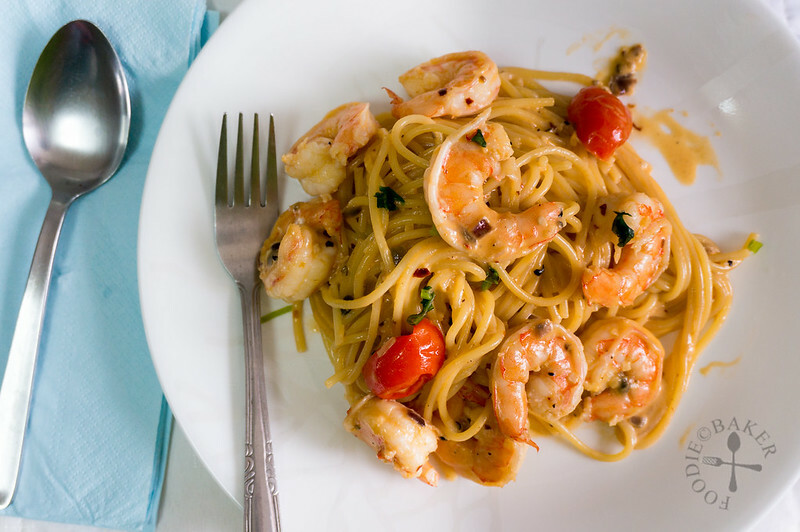 Thank you so much for linking this pretty delicious pasta to Little Thumbs Up ! Hi Anne! Thank you for hosting such a wonderful theme! I have another recipe to add to the collection, fingers cross I can post them by this week! Wow this looks amazing! And love your food photography, really makes the pasta stand out! Jasline, this is an awesome recipe. I especially like how you used the prawn shells to make the broth. This is just how they do it in the restaurants here in HK. That close up shot cinched the deal. I have to make this as soon as I can. I will touch base with you soon regarding a plan for meet up in SG. I am so excited! Sharing your recipe everywhere, of course! Hi Bobbi, thank you so much for sharing! Hope you and your hungry teenagers will like this! I can’t wait to see you in SG too! Very soon! 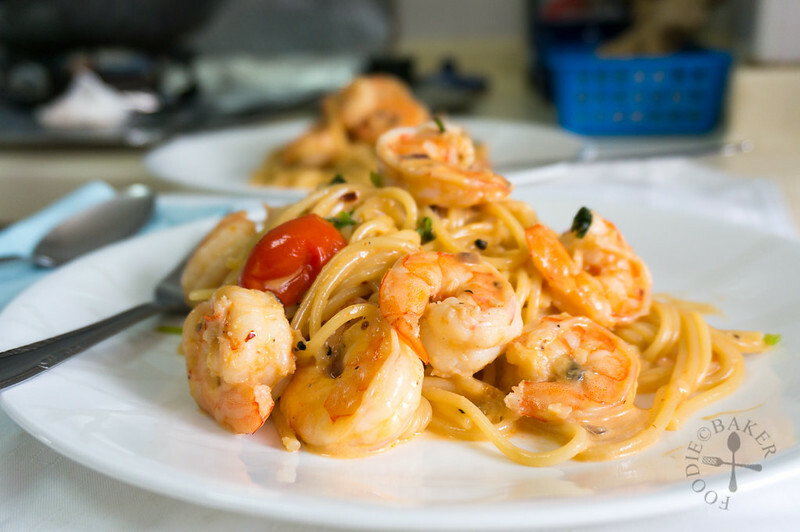 Your prawn pasta looks lovely, the colour is so fresh! What a coincidence I just made some prawn and mushroom pasta called Spaghetti Mare e Monti, nearly similar. I love the lemony twist on this one. What a coincidence indeed! Love mushrooms in my pasta as well, can’t wait to see your recipe!